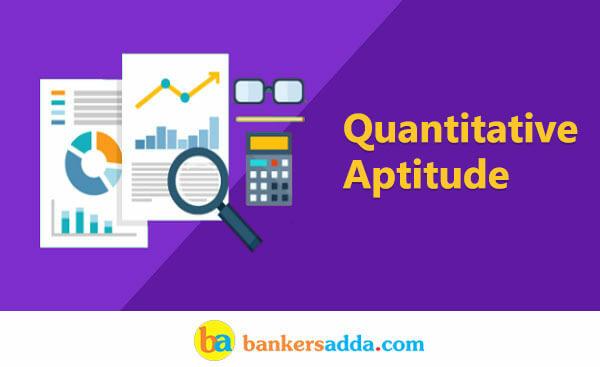 Quantitative Aptitude Section has given heebie-jeebies to the aspirants when they appear for a banking examination. As the level of every other section is only getting complex and convoluted, there is no doubt that this section, too, makes your blood run cold. The questions asked in this section are calculative and very time-consuming. But once dealt with proper strategy, speed, and accuracy, this section can get you the maximum marks in the examination. Following is the Quantitative Aptitude quiz to help you practice with the best of latest pattern questions. Direction (1-5): The following pie-chart shows the no. of persons (in degree) who were awarded for their bravery and intelligence during critical conditions in the year 2017 in various states. Study the graph carefully to answer the following question. Note: Some data in pie-chart are in degree and some are in absolute value. Q1. Find the total no. of person who were awarded for their bravery and intelligence in the state UP, Maharashtra and West Bengal together. Q2. Total persons who were awarded for their bravery and intelligence in states Haryana and Kerala together are what percent more or less than that in state Maharashtra? Q3. If ratio of male to female who were awarded for their bravery and intelligence in states MP and west Bengal be 2 : 1 and 1 : 2 respectively then total females of MP are approximately what percent more or less than the total females of west Bengal who were awarded? Q4. Find the average no. of persons who were awarded for their bravery and intelligence in states UP, MP and Kerala together. Q5. What is the difference between total no. of person who were awarded in states UP, Kerala and West Bengal together and total no. of persons who were awarded in MP, Maharashtra and Haryana together? Q8. 10 men and15 women together can complete a work in 6 days. It takes 100 days for one man alone to complete the same work. How many days will be required for one woman alone to complete the same work? Q9. A, B and C and complete a work in 10, 12 and 15 days respectively. They started the work together. But A left the work before 5 days of its completion. B also left the work 2 days after A left. In how many days was the total work completed? Q10. There are two bags, one of them contains 5 red and 7 white balls and the other 3 red and 12 white balls, and a ball is to be drawn from one or the other of the two bags. Find the chance of drawing a red ball. Directions (11-15): What will come in place of (?) in the following no. series? Q11. 3.5, 8, 15.5, 26, 39.5, ? Q12. 2, 7, 19.5, 50.75, ? Q14. 1, 1, 2, 6, 28, ?